Very Good. Berenstain Bears & Trouble Friend (First time books) by Berenstain, Jan, 1989-08-17. Trade paperback (US). Picture book. Glued binding. 32 p. Contains: Illustrations. Berenstain Bears First Time Books. Intended for a juvenile audience. Good. 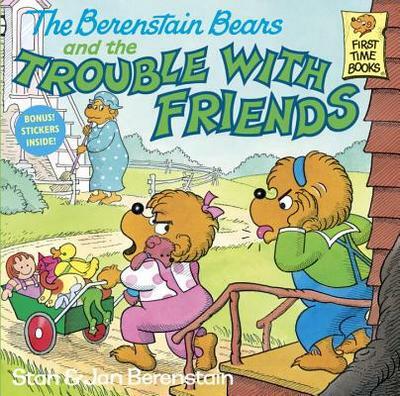 Berenstain Bears & Trouble Friend (First time books) by Berenstain, Jan, 1989-08-17. Trade paperback (US). Picture book. Glued binding. 32 p. Contains: Illustrations. Berenstain Bears First Time Books. Intended for a juvenile audience. Sister has fight with her new best friend involving toys. To a school age child this is an end of the world fight. The children's feelings are not trivialized. Mamma Bear tdoes not tell her kid the fight was just stupid, go apologice. No, she sits Sister Bear down and discusses through the problem. Sister Bear is able to grasp her emotions better when relating the events back to her mother. This is a great lesson on the importance of comminication.